Some in Washington and in the news media have seized on a study I conducted with David Romer, my husband and colleague, that they say shows tax increases having a bigger short-term effect on the economy than spending cuts. That’s a very polite, scholarly way for saying, how’s about you people go read the paper before you talk about it? I’ve been thinking about the comparative advantages of broadsheet versus digital reading of newspapers. One advantage is for the web: Romer can just provide the whole world with a link to her excellent original manuscript, which was published in AER [pdf]. Professor Cordes and I were discussing this manuscript, and Cordes pointed out that the original paper is a nice example for PhD students to study because it blends archival research to nail the exogenous changes and then uses that to specify and estimate an econometric model. The other nice thing about the manuscript, other than the brilliant writing, are the ways that the models are illustrated. It’s not an overly mathematical piece to begin with, but a layperson giving a close reading to the results and the graphs can understand what is going on here. There is a basic reason why government spending changes probably have a larger short-term impact than tax changes. When a household’s tax bill rises by, say, $100, that household typically pays for part of that increase by reducing its savings. Its spending tends to fall by less than $100. But when the government cuts spending by $100, overall demand goes down by that full amount. Wealthier households typically pay for more of a tax increase out of savings, and so they reduce their spending less than ordinary households. This implies that tax increases on wealthy households probably have less effect on the economy than those on the poor or the middle class. She also gives cuts their due in the article. 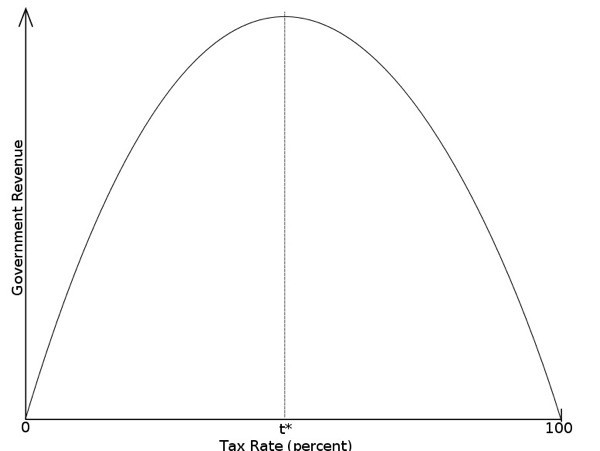 Romer also links to a nice review that appeared in the Journal of Economic Literature that synthesizes the empirical work on how people respond to tax rates, one of the basic aspects of the Laffer curve idea, the holy grail of Reagen-era supply siders. This isn’t the most sophisticated graphic you’re going to find (thanks, Wikipedia), but it works. The idea is that as governments increase the marginal tax rate, the amount of revenue they raise goes up until it hits a critical point. Then the revenues go down because people progressively scale back on doing the productive things they do to generate income because that income is worth less and less to them, and thus, the whole pot of income to tax goes down, and thus, government revenue goes down. Not the worst theory ever seen, certainly. But the key empirical questions are: where is the downward kink, and where are we relative to the kink? Or, more realistically, the downward kink(s) because different class groups and wealth groups are probably going to act somewhat differently from each other and from the aggregate function shown in the picture. The JEL piece by Saez, Slemrod, and Giertz talks about the behavioral aspects of the income changes, and as Romer suggests, finds that behavioral changes are pretty slight. Alternatively, you can go with Glenn Beck’s version of the Laffer curve. In fairness, it’s not the easiest set of concepts to explain. But also in fairness, he blazes new trails in screwing it up. My various macro professors, particularly Charles Whiteman, will probably need to dive into the drinks cabinet to get through this one. I’ll post more about some other interesting aspects of Romer’s article tomorrow.